Culture is crucial to feeling connected to where one belongs. 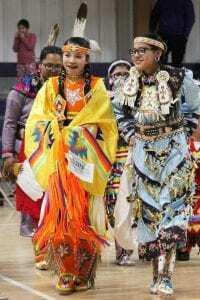 Cultural activities usually bring generations together and that made an event like Dupree School’s first ever powwow (wacipi) and handgame tournament even more important. 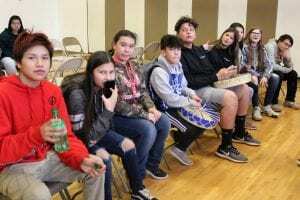 Dupree school’s Lakota Club and handgame teams became active a few years ago, and they have been traveling long distances to compete in tournaments and doing very well. Their great experiences at other schools inspired them to host an event as well. On Friday, March 28, thirteen elementary teams and ten high school teams came to enjoy and compete at the Dupree School Wacipi. Dupree’s Lakota Club leader, Medina Matonis, was in charge of the event and many others volunteered to help. The schools that came to the event were Crow Creek, Crazy Horse, Takini, Little Wound, Tiospaye Topa, Todd County, Loneman, American Horse, Lakota Waldorf, Oelrichs, and St. Francis. Leading, supportive, and entertaining voices at the event were Wacipi Eyapaha Richard Charging Eagle and Arena Director Wiyaka Chasing Hawk. The Hanpapechun Eyapaha (for handgames) was Teca Wacipi Okolakicive President Jonas Horse Looking, and the Head Judge for those events was MJ Swan. Guest judges were Tammy Waloke and Joseph Dupris, who stepped judged when Dupree was competing, to keep things fair. After a long day that kicked off with a Grand Entry incorporating all the dancers, handgame players, six drum groups, and others, the high school division handgame winners were announced. The champions were Little Wound and second place was earned by Dupree School students. In the elementary/middle school division, the handgame champions were from American Horse and second place went to Takini players. There were many adults involved in making sure the event ran smoothly; however, the DHS Class of 2019 held a special role as they’ve been working with Medina Matonis the last few weeks to learn more about handgames and act as judges for the tournament. The DHS Class of 2020, led by their adviser Gnene Fordyce, ran a concession stand during the event. Other students that helped out by serving the free meal at the end of the day were Bennett Brooks, Maxwell Peacock, Hayley DePoy, Shantell Brewer, Amber Donovan, Sidni Ferguson, Natalie Veit, McKenna Dupris, Kadynse Buffalo, Marlene Woodward, Valerie Janis, Justin Matonis and Kateri Matonis. Additional volunteering came from Kim Shannon, who created a beautiful “Welcome to Dupree Owayawa” sign, and Jason Matonis, who set up and ran equipment so that the event was live streamed via the Dupree Facebook. 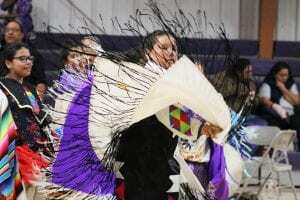 Jashawna Iron Hawk put on her Dupree Wacipi shirt that she won dancing. Maxwell Peacock designed the shirts and hoodies for the Wacipi event.